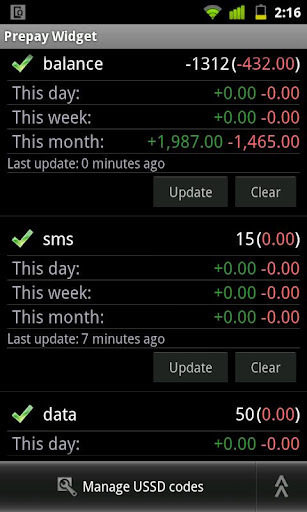 Overview: Your balance, free minutes, traffic and SMS as simple text widgets! You need not even know that updates have taken place and the app will never turn on the screen to send a request. Cell providers reply to short commands like *100# or *123# with useful information. Using these codes you can monitor your account balance, the status of free minutes and SMS or remaining data traffic. WILL NOT WORK ON SOME STOCK SE AND SAMSUNG DEVICES WITHOUT ROOT!